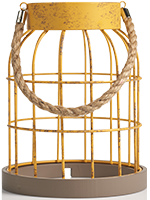 A warm, yellow, rustic bird cage with rope handle and wood base detailing has a distressed-painted finish to appear as if it has been in the family for years. 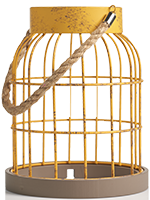 Layer it with our Sunflower Warming Shade for an infusion of energy and happiness. Measures 6.75” diam. x 8.5” h.